A most unwelcome return to crappy Master System box art. You win this round, Europe. R.C. 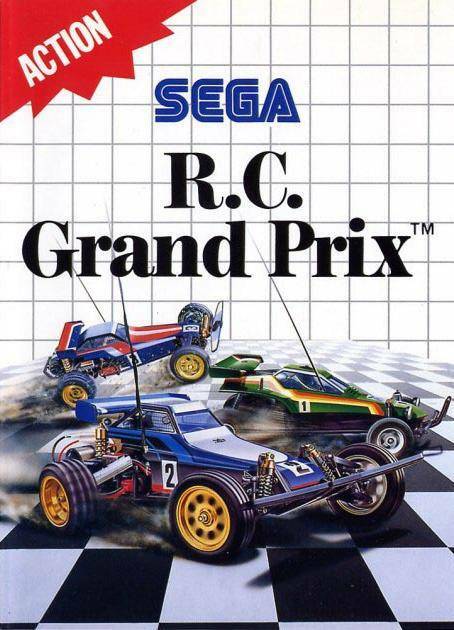 Grand Prix is a mix of remote controls, tight turns, and drunken recklessness. The controls will infuriate you with their preciseness until, suddenly, after several races, their finicky nature makes complete sense. 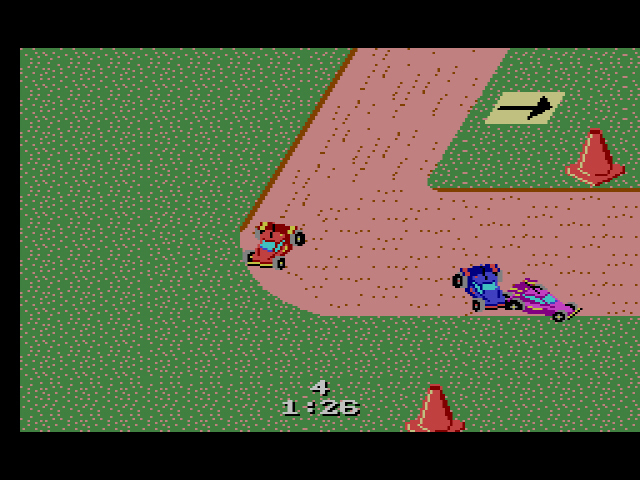 The AI cars are impossibly fantastic, besting you at every corner – until they get stuck on a turn and are unable to extract themselves. And the courses all look and feel the same, save for the turns which surprise you even when you know where they are. Into the turn, we go. You control a red RC car and are pitted against three other RC cars in the fight for money, gold trophies, and upgraded parts. There are ten courses, each of which has a differing number of laps and a time limit. The higher your rank upon completing the race, the more money you receive. Provided you have enough money after a race, you’ll be whisked away to a parts store, where you can upgrade tires, suspension, batteries (lest you forget you’re driving an RC car) and more. There are several different types of parts, but you’ll want to buy the Ultra parts if you’re looking to beat the game. And in order to get all the money needed for the Ultra parts, you’ll need to come in 1st place on every race. Nobody ever said RC life was easy. 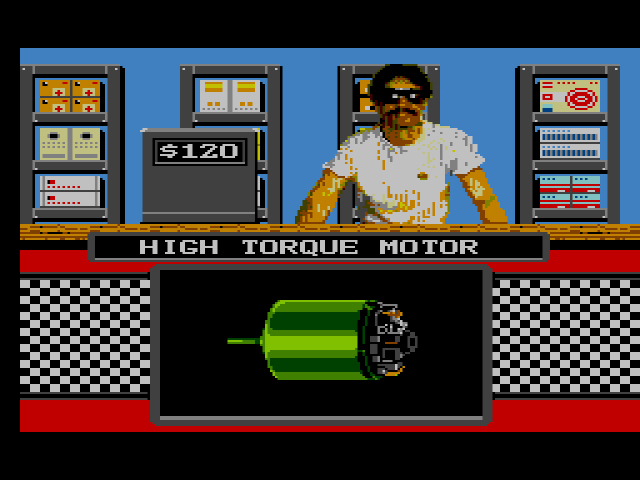 Tom Selleck’s your pusher for black market RC parts. The courses start off with simple up/down/left/right turns. 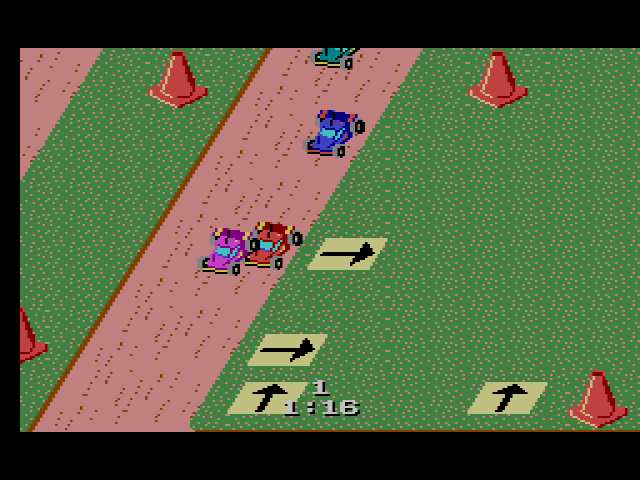 As you progress, however, the increasingly elaborate turns will require course memorization and becoming one with the controls in order to beat the race. Before you come to a turn, you’ll see arrows on the side of the course showing you which direction to turn. And as if arrows weren’t enough, you’ll also hear a ‘ding’ noise that will alert you to the turn. The inclusion of a ‘ding’ was thoughtful, but it’s the arrows you’ll want to pay attention to. They appear slightly before the ding and are a better indicator of when you should turn. The racing itself is fast and chaotic, which at first seems problematic. The controls don’t respond as quickly as you want them to and the computer cars are always in the way. Despite your best efforts, you’ll also bump into the corners and sides a lot. But after four or five races, everything – speed, controls, turns – clicks into place. I can’t explain this. In fact, for the first three races, I was ready to shove an ‘F’ grade onto R.C. Grand Prix for what I felt were unresponsive controls. But I held out. I grew accustomed to the game’s speed, I learned when/how to turn properly, I figured out how to exploit the computer (knock them into the corner on certain turns), and – what do you know – R.C. Grand Prix became a certified gas. Who knew R.C. racing could be so, uh… yeah. I made it to course eight before I pulled out of the Prix. This particular trial has you going around in two large almost continuous loops, turning constantly. 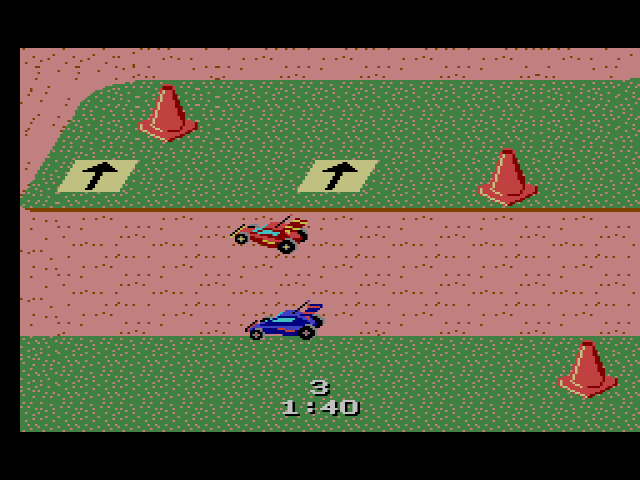 In order to complete the course, you have to do four laps in a minute or an insane fifteen seconds a lap. Even if you’re good at turning, it’s nearly impossible not to hit the walls at some points. Hit as few as you can, don’t get stuck on a computer-controlled car or turn, and drive like hell. Even then, you probably won’t win. I’ll do that when I’m dead. 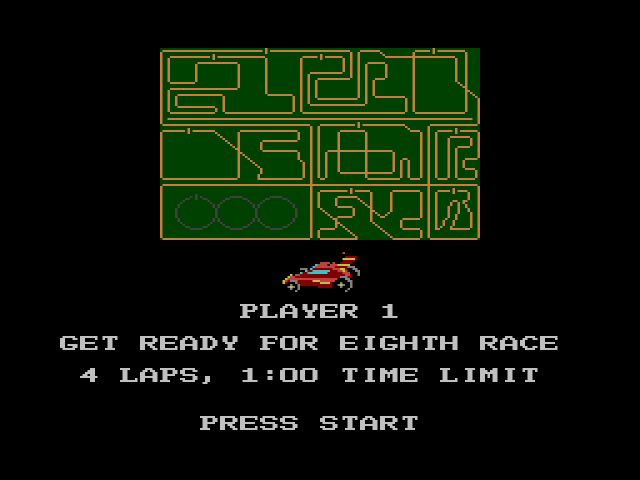 I kept trying to beat course eight, despite losing at least a dozen times. I wasn’t so much driven by the need to win as I was to just keep playing and learning. R.C. Grand Prix is addictive, to say the least. The controls could be tweaked a little, the course designs could look less monotonous, and the game should have true multiplayer instead of the ‘pass the controller back-and-forth’ nonsense. But despite these issues, R.C. 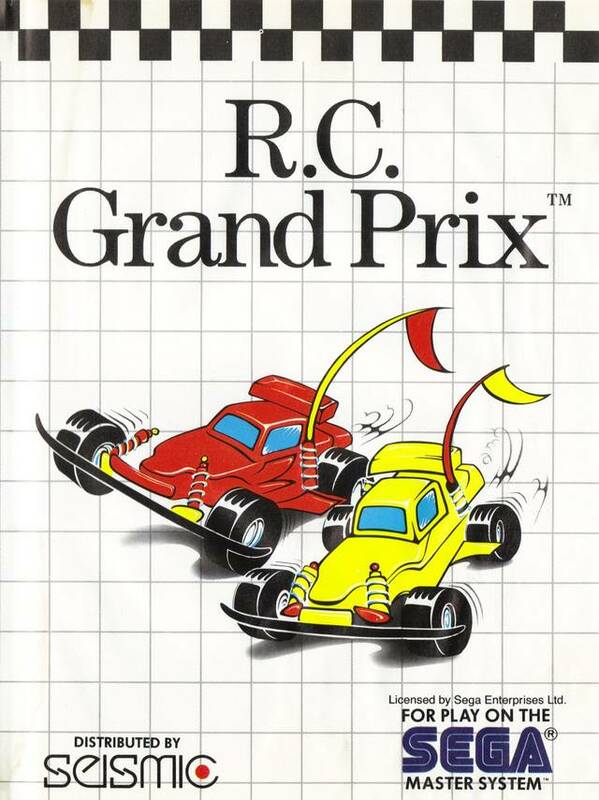 Grand Prix is – dare I write it – almost as fun as RC Pro Am for the NES. Strangely, I don’t think I’ve ever heard of this game. Which inclines me to believe 1990 or later. Looking through the Sega challenge newsletter, which ended in Dec 89, there is no mention of the existence of this game in the final two issues. I highly doubt it was a 1989 release. That said it looks like fun. Maybe a little to late to cash in on RC Pro Am mania. To be honest I never thought RC Pro Am controls were great initially righter till I got used to them. Also Seismic and Absolute didn’t release anything on the Genesis till 1990 and later, so I’d be surprised if they released anthing on SMS in 1989. I wish SegaRetro would cite their sources. Your own sources have never been less than reliable, but in this case, I’m going with the majority until shown otherwise. It’s funny that just now I read something about this game and it’s release. Literally 20 minutes ago Retromags just released their scan of EGM #10. May of 1990. On page 84 They talk about this game as an upcoming game for recently signed Seismic at the 1990 CES in Vegas. So it was probrably late 1990 at that. Interesting article. Also talks about alot of games that were released in Europe in 89 but not released in the US till later. Like Outrun 3D and Psycho Fox. Man, RC cars sure were big in the 90’s, hey? I still remember a ton of commercials for them that aired during Saturday morning cartoons. They’ve kind of made a come back, but for adults and they use stuff like ethanol for fuel. Last time I saw an RC car was when my uncle was playing with a heavily modified one. So yeah, seems the target audience has advanced in age.